Datsun 280Z for sale soon with only 59.000 miles. Exotic classics is pleased to present this 1977 Datsun 280Z 2 coupe, featured in sunburst yellow with a black leather interior. This vintage rear wheel drive sports car is powered by a 2.8 liter single overhead cam inline 6 cylinder engine with a 4 speed manual transmission. The 1977 z produced 170 horsepower and has an independent rear suspension, as well as rack and pinion steering. The 1977 280Z had a top speed of 205 km/h and did zero to 60 mph in just 8 seconds. The 260Z lasted only one year in the US before being replaced with the 280Z. US emissions controls had sapped the L26 of all it's power so a new model was required. Carburettion was abandoned as it had caused so much trouble with the 260Z. The new Bosch L-Jetronic fuel injection system was fitted instead to a 2.8 liter L28 engine. Although performance was not as good as the original 240, it was still far better than the 260Z and the later 240Zs. The 280Z was also heavier, thanks to a larger engine, the fuel injection, and a more fully equipped interior, and longer thanks to it's massive 'federal' bumpers required by US law. The 280Z also featured air-conditioning, and larger tyres. By now, the Z cost $9000 in the US, and no longer seemed quite the bargain it had originally been. However, it had also become accepted, and no longer needed to use Bargain Basement pricing as a draw card. The 280Z was actually the most popular of the first generation Z cars, with 230,128 being built, compared to 156,076 240Zs. In April 1977, an official pace car for Long Beach Grand Prix, was designed by Nissan U.S.A.. It became a special limited production decore package for US Market right after the race. 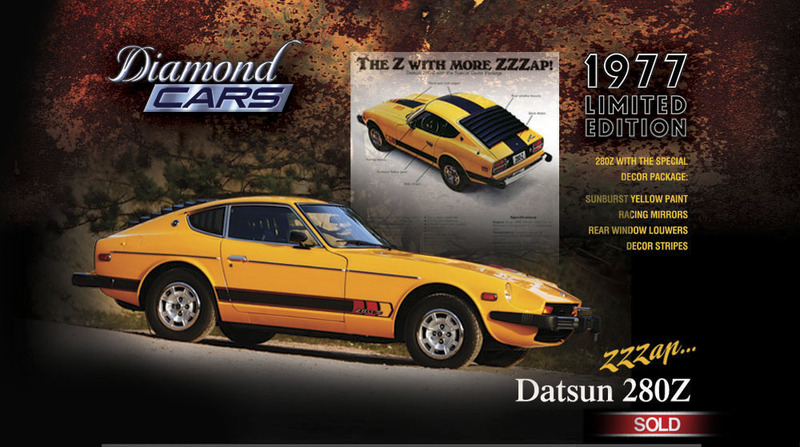 Approximately, 1,000 280Z sunburst yellow 280Z cars were given the name łZZZAP˛ with special features. 1. Rear louver (Screw on hinges and locking devise at bottom. 2. Sport mirrors RH&LH 3. ZZZAP decal kit (Hood, roof, deck, front fenders, doors, quarter panel at front and rear of the wheel. So far, after long reaserch, we have found out few facts: Production date of ZZZAP package cars were available only in 1977. (Sep 1977 is 1978 model year with no Sun Burst Yellow). First 12 ZZZAP package cars were displayed and sold by 12 Datsun Dealers in Southern California. Out of first 12 cars, only one came with Automatic Transmission.